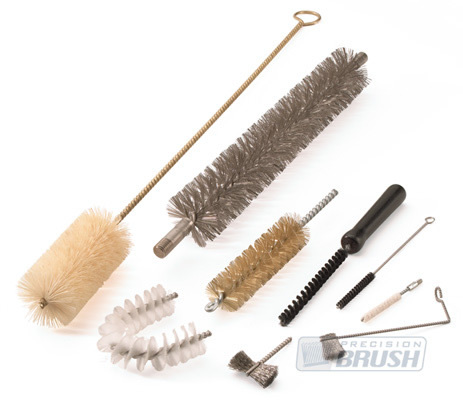 Twisted-in-wire brushes are commonly referred to by our customers as “twisted brushes”, “tube brushes”, “bottle brushes”, “pipe brushes”, “spiral Brushes”, “power or internal cleaning brushes”. They are suitable for both hand-held use and for use in power tools, including drills, drill presses and CNC machining centers. Important: Reversing a twisted-in-wire brush may loosen the stem wire, causing a loss of fill bristles. Always rotate the brush in a clockwise direction when the brush points away from the user. This will tighten the brush construction. These illustrations depict the three twisted brush stem constructions available to you. Single-Stem Single-Spiral - Filaments are twisted between two stem wires with a single layer of filament. Double-Stem Single-Spiral - Filaments are twisted between four stem wires with two stem wires on each side. This results in a brush with a much stronger base and potentially greater filament density. Double-Stem Double-Spiral - Filaments are twisted between four stem wires with two layers of bristles. Each layer is perpendicular to the other with a single stem wire in each quadrant. This results in a brush with the highest filament density and highest strength. Note: wire fill material is not recommended for a turned tuft brush tip. Note: Power-driven brushes should be firmly chucked into a suitable holder at all times. Always wear eye protection and follow safety guidelines. Important:Reversing a twisted-in-wire brush may loosen the stem wire, causing a loss of fill bristles. Always rotate the brush in a clockwise direction when the brush points away from the user. This will tighten the brush construction. There is a large variation of brush diameters available. However, the brush diameter will depend heavily on the selected stem wire construction as well as the filament being used. A shorter trim-length or larger bristle diameter will stiffen the brush. The fill material selection is determined by your particular application as well as the size of your brush. Standard fillings for twisted-in-wire brushes include synthetics, natural fibers and wires. Stem wire materials used in twisted-in-wire brushes are galvanized steel, stainless steel and in some cases, brass or aluminum wire. The stem gauge is the diameter of the stem wire that is used to twist the filament into the brush. Long-lasting industrial tube brushes can be used in manual cleaning or be adapted for use with power tools. Brush style, shape and fill materials can be customized to ensuring optimal brush surface contact and polish effectiveness. Common twisted tube brush users include industrial users, electronic manufacturers, scientists and product designers. But bottle brushes are perfect for cleaning the interior surfaces of all tubes, internal threads or drilled holes in nearly any industry.